Gates & Grills - Beejay Home Improvements, Inc.
and roll down gates for businesses, homes, stores, and more. We’re licensed, insured, and offer support 24 hours a day. We use Made in the USA Steel and Custom Build SECURITY GATES for your Home or Business. ​Call Us at 716-894-8989 to Schedule a Service Call regarding the Measurement of Your Security Gate at your Home or Business. You can count on our decades of experience to bring you the Style, Reliability, and Security your home or business deserves. Call Us Now for a Free Quote and Fast, Reliable Service! Imagine the dramatic effect when you have an Iron Security Gate installed at the entrance to your Home or Driveway! You can visit our SHOWROOM at 1588 Broadway in Buffalo 14212 to discuss the many options available. ​Make your home Amazing and Secure today by having an Iron Security Gate installed by Beejay Home Improvements, Inc. Manufactured Custom in Buffalo for Buffalo using USA steel to your design specifications, dipped paint finish process insures beautiful and long lasting security. Heavy gauge steel gates are classically designed and offers the security and customability you want at a great price. We customize your gate using our exclusive line artwork and spear tips to create the look you want. The driveway gate is paired with the optional Lift Master automatic linear arm gate opener. The Lift Master features a built-in receiver with 2 key chain style remotes included. Operators use standard 110VAC power input and includes a step-down transformer to 24VDC. The 24VDC operating voltage enables the unit to operate during primary power failure using two 12V batteries (optional). Add the optional solar panel and controller, and this unit is fully functional on solar power only! Call Beejay Home Improvements, Inc. at 716-894-8989 to Schedule the Installation of your Driveway Security Gate today! Security Shutters are USA made Steel Rolling Shutters, similar to hurricane or storm shutters. Beejay Home Improvements, Inc. is a small enough company to give you individual service you deserve yet large enough to give great selection and service. 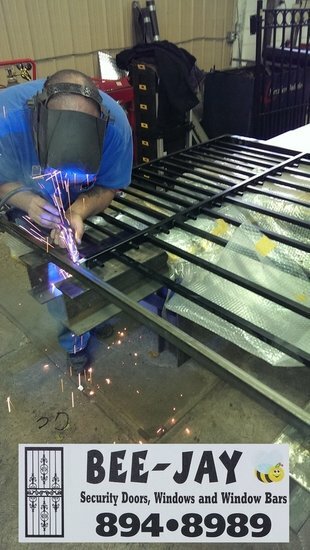 Custom made means we can change, alter, and customize the gate to your needs. Security Rolling Shutters can be motorized for convenience. Power by 110v with wall mounted control switches or remote Beejay Home Improvements, Inc.'s security shutter manufacturing uses 20g steel slats that can be foam filled or double walled with an Wind lock retention system for added security. Slotted Slats can be added for light control while still providing same security. We Sell, Service, and Install ELECTRIC MOTORS For Security Shutters and Security Gates. Ask Us How To "Open Your Security Gate With A Touch Of A Button!" Centrally located heavy duty mortise lock on the bottom bar that locks into the side rails, our system allows you to keep your entryway free from tripping hazards. Common Applications Include: Storefronts, Counter (Bars, Tiki Bars, Pharmacy), Gun Stores, Gun Racks, and Shopping Malls, Commercial Kitchens. Hurricane Shutters protect against Storms and add an extra level of security to your home or business. Storm Shutters are decorative in nature and increase the potential for energy conservation. Visit our SHOWROOM at 1588 Broadway in Buffalo 14212 to see our many styles or call us at 716-894-8989 to Schedule a Service Call ​for the installation of Hurricane Shutters, Storm Shutters, Decorative Shutters, or Security Shutters. ​We offer Barrier Entry Products for All Opening Types and Sizes. Our Security Scissor Gates offers track and folding steel made with 100% USA made galvanized steel. Galvanized steel folding gates are the strongest folding gates you can buy. They stand up to weather, and are rust resistant so they’ll look better and lasts. Our galvanized dip coating bonds to steel 10 times stronger and maintenance free. Our Class Types include: Pair Gates, Single Standard Gates, Portable Gates, and Pedestrian Door Gates. Beejay Home Improvments, Inc. has a fleet of service vans with almost every type of repair part needed for jobs. ​That means we can usually fix an overhead door problem on our first visit. So put your trust in a company that will save you money as well as valuable time. GET HELP FROM THE TRUSTED PROFESSIONALS AT BEEJAY HOME IMPROVEMENTS, INC.
​We’d love to hear from you. ​Call or fill out our Contact Form for a Free Price Quote on our overhead door repair services.